As North America's top competitors descend on Toronto for the National Axe Throwing Federation championships, journalist Kate Knibbs tells us how a recreational activity for wannabe lumberjacks has spawned a competitive league sport. 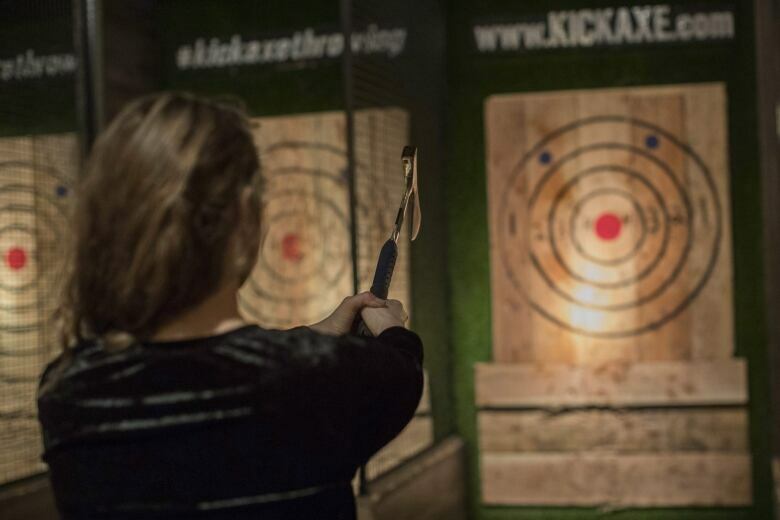 If you've ever wished you could make an athletic career out of throwing sharp objects at a bullseye, axe throwing could one day be your sport. It may sound like a treacherous pastime, but over the past decade, it's become a common weekend activity for friends who meet up to drink beer and chuck axes at a target. Olympic podiums are still far off for the relatively new sports' athletes. But in recent years, leagues and tournaments have begun to crop up. This weekend, Toronto will host more than 1000 contenders at the National Axe Throwing Federation Championship Finals — one of the biggest competitions to date. 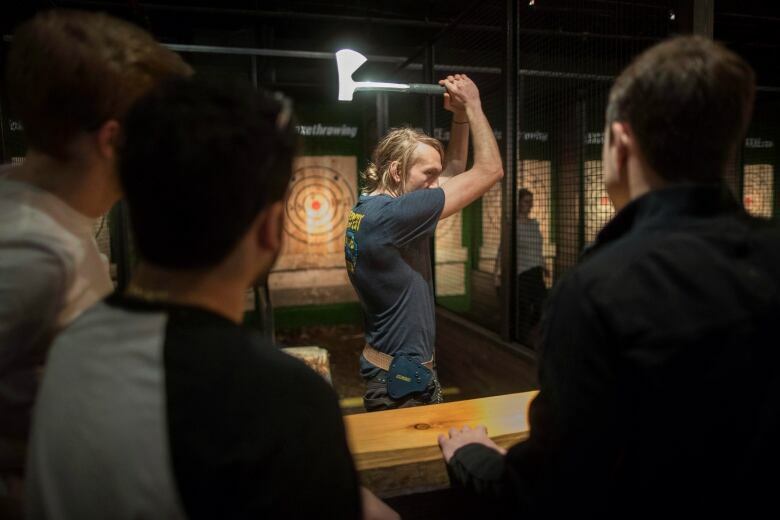 Meanwhile, the game's Toronto-based founder wants to codify axe throwing as an internationally-recognized sport. Day 6 host Brent Bambury spoke with Kate Knibbs, a staff writer for the sports website the Ringer, about the burgeoning industry. Here's some of what she had to say. Well, there haven't been any egregious injuries yet, Knibbs said. The blades are sharp, sure, "but I think people have been exercising common sense while throwing them," she added. "I found it sort of similar to darts or archery where the thing that you're holding is sharp, but you're throwing in such a way where it's safe." OK, but is it a lot of work? If you're not used to lifting an axe over your head, it might take some getting used to. But for Knibbs — who claims she hit the bullseye in her first round — it was an exciting experience. "I found it very satisfying and I felt like Lady Paul Bunyan, sort of," she said. "It was a nice rustic feeling." "It's fun to throw things and, yeah, there's something satisfying about the sound of like a blade hitting wood." It's impossible to say who was the first person to throw an axe for fun, but the modern version of the game is credited to Canadian Matt Wilson. He started a small league among friends in his Toronto backyard in the early 2000s. 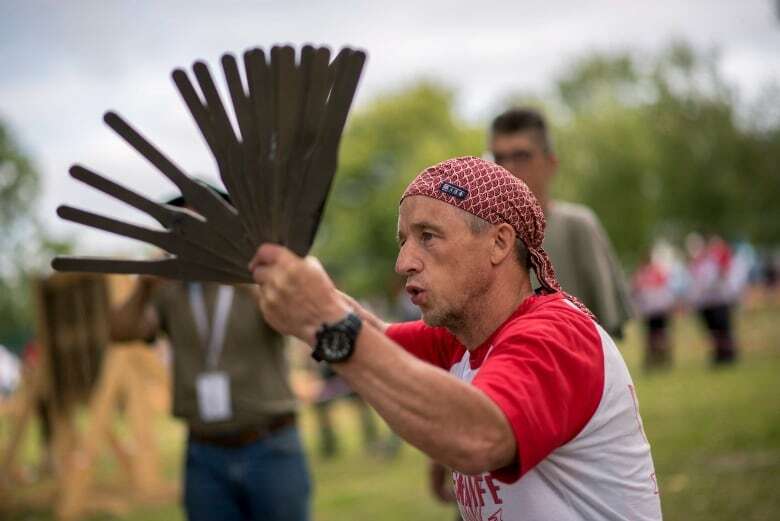 From there, he founded a quickly-growing company, the Backyard Axe Throwing League, eventually establishing 14 locations across North America. Wilson now runs the largest league in the world. According to Knibbs, the organization is backed by venture capitalists who "see this as an opportunity to get in on the ground floor of something that could really blow up as a popular sport and a popular leisure activity for people." Leagues? How big is this? It may not be as big as basketball, but it's growing. Wilson and his team have big ambitions. Eventually, they would like a grand slam-style tournament for the sports' best players, according to Knibbs. She said they also aspire to make axe throwing an Olympic sport one day. In the meantime, tournaments — with cash prizes as high as $20,000 — are popping up across Canada and the U.S.
"Since around 2013, there's been an explosion of interest and axe throwing venues are popping up now all across North America," Knibbs said. Philadelphia is the epicentre for axe tossing in the United States. Australia and Western Europe also boast some leagues. Awesome. Can I throw a really big axe? Most venues use one size axe, but some leagues use a larger size, Knibbs said. 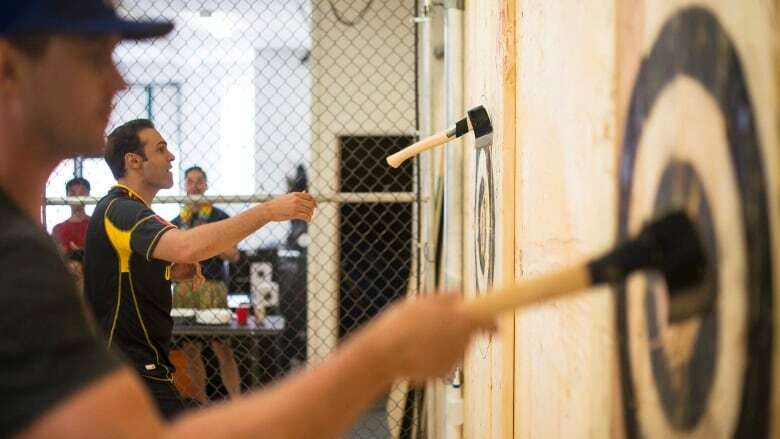 Is axe throwing here to stay? Knibbs doesn't know for sure, but she's optimistic. Though it's unlikely it will be as popular as competitive sports like soccer or football, it could have the same appeal as surfing, Knibbs said. "Or curling, even, where there's a level of professionalism and there's definitely mainstream interest," she added. "I hope it doesn't go the way of lawn darts, because it's more fun than lawn darts." To hear the full interview with Kate Knibbs, download our podcast or click 'listen' at the top of this page.